In February I went to Geysir in Haukadal with my recording gear. 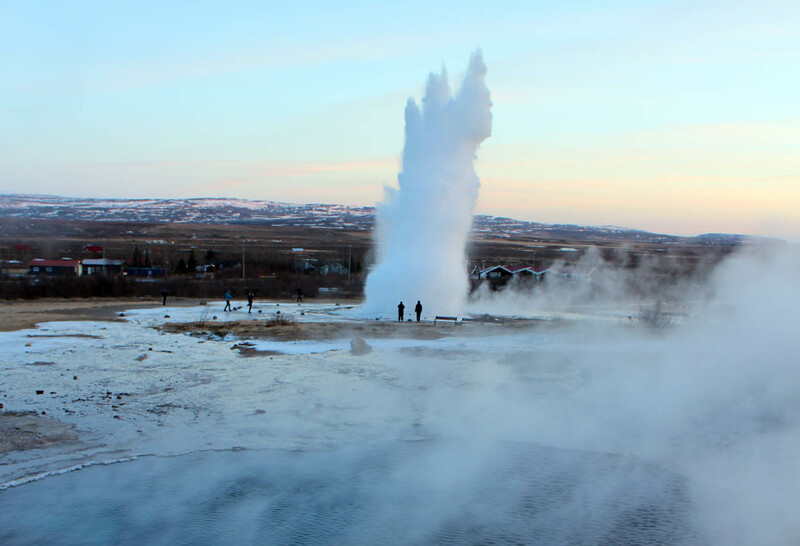 The plan was to record the sound in Geysir and other hot springs in the area with hydrophones. But when I arrived it was both windy and freezing cold so I did not make as many recordings as I expected. Anyway, I got some recordings that I mixed together in one 20 minutes session. It started with eruption in hot spring named Strokkur. It usually erupts every five to ten minutes and is one of the most attractive things in the area today. Then, we dived down to the tube of Geysir. It is now some decade since it erupted automatically so now it is just a quiet deep hole in the ground full of hot water. Then Strokkur erupted again before we dived into the “blue side” of the hot spring Blesi. After several minutes Strokkur erupted again and we dived into the ”deep side” of Blesi. Then we went to the surface and listened to two eruptions on Strokkur in a fellowship with two tourists. Í febrúar gerði ég mér ferð í uppsveitir Árnessýslu með upptökutækin. Var komið við á stöðum eins og á Geysi þar sem hljóðnemar voru brúkaðir bæði ofan jarðar og neðan. Vegna roks, kulda og myrkurs náðist ekki að hljóðrita allt það sem til stóð, en eftir stóðu þó upptökur sem hér hafa verið dregnar saman í stutta 20 mínutna langa hljóðmynd. 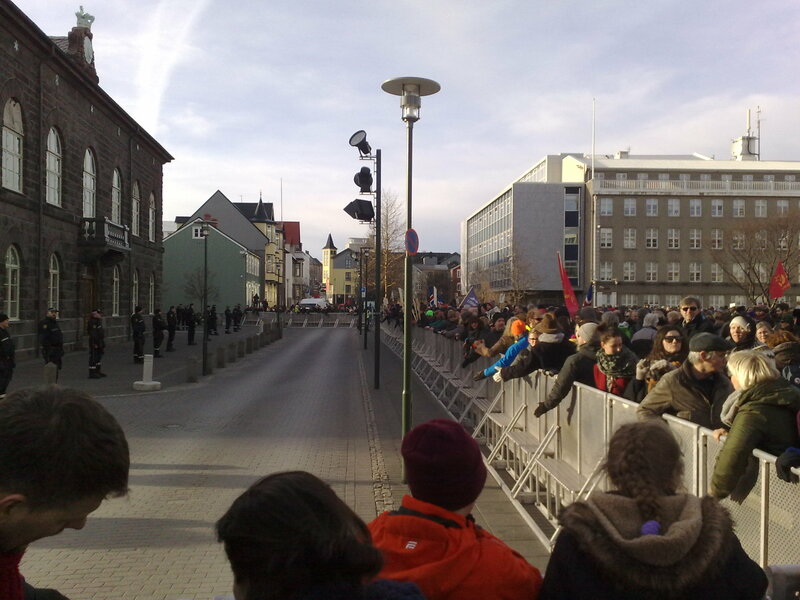 Around 4,000 people turned up to Austurvöllur square in front of the parliament 24th of February to protest the decision by the ruling Progressive and Independence Parties to put forward a resolution to withdraw from European Union talks. Fólk fjölmennti á Austurvöll framan við Alþingishúsið þann 24. febrúar sl. til að mótmæla slitum á aðildarviðræðum við ESB. 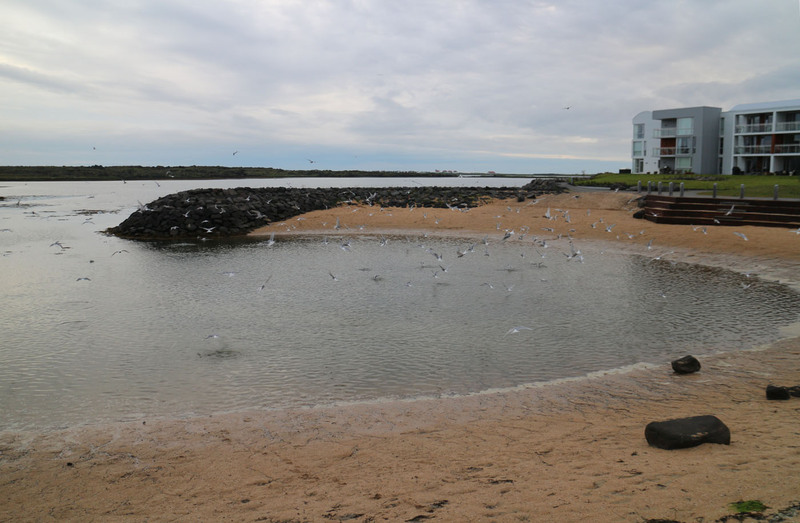 Í raun átti að ganga svo frá hnútum að það væri allt eins ógjörningur að fara í slíkar viðræður í framtíðinni. Fyrsti dagur þessara mótmæla var 24. febrúar og héldu þau svo áfram fram eftir vikunni eða þar til að stjórnarliðar sáu að sér og ákváðu að afgreiða málið með einhverjum öðrum hætti. Meðfylgjandi upptaka var tekin upp á fyrsta degi mótmæla norðan við dómkirkjuna rétt fyrir kl. 16. 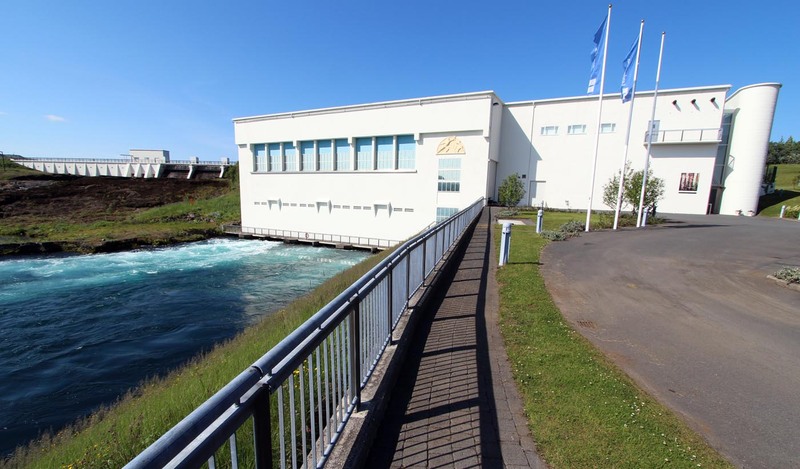 Lögreglan hafði girt af Alþingishúsið með álgirðingu sem nýttist dásamlega vel til að koma óánægju almennings til skila inn í sali Alþingis. 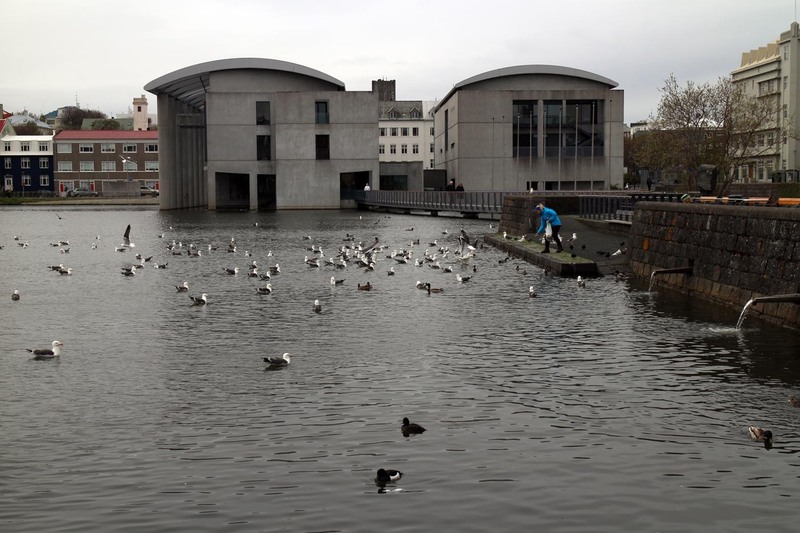 Reykjavík Culture Night was held for the nineteenth time on 23rd of August 2014. 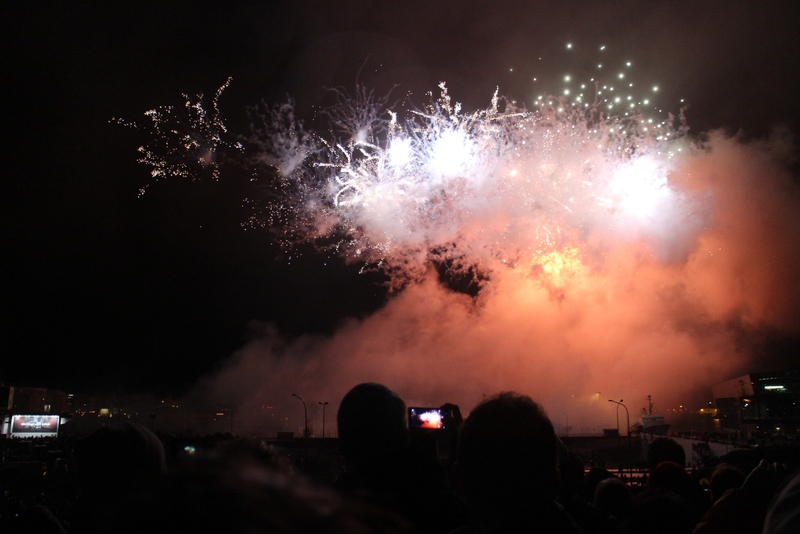 As usual it normally ends with a big concert and a fireworks in Reykjavík downtown. This year the weather was wet but warm. I was soaked when the fireworks started, and I was probably not in the best place to record fireworks. But it was as interesting to listen to the joyful crowd during the show. In just 9 minutes they blew up three tons of fireworks from several places around the concert stage. More information about this dance project and Reykjavik culture nights. Upptaka frá flugedasýningu menningarnætur 24. ágúst 2013 í blautu en hlýju veðri. Því miður má heyra það á upptökunni að vindhlífin var, þegar þarna kom við sögu, orðin gegnblaut. En engu að síður, stemmningi skilar sér bærilega. Early May I went into the Raufarhólshellir cave with a group of peoples. 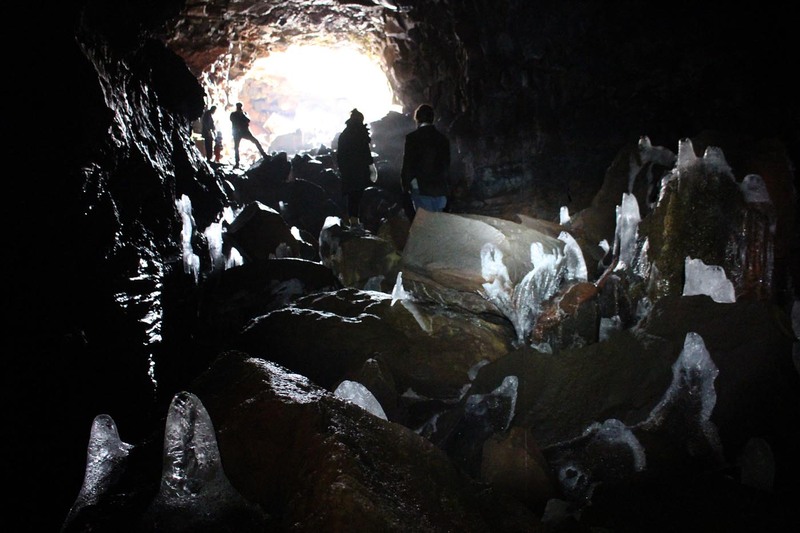 The tour was done to listen to the sound in the cave when water drops fall on ice on the floor. This sound can be really amazing when hundreds of drops fall in to all kinds of sizes and depths of holes in the ice. But, most of the ice was gone, so the sound was not as expected. Anyway, the experience and the sound was nice. Annan maí s.l. fór ég með ágætu fólki í Raufarhólshelli til að hlusta á vatnsdropa falla niður á ísinn á hellisgólfinu. Við viss skilyrði, þegar gólfið er ísi lagt, þá mynda vatnsdropar misdjúpar holur í ísinn. Þegar svo droparnir falla í þessar holur heyrist heil sinfónía af dropahljóðum sem er ákaflega gaman að hlusta á.
Því miður þá var mestallur ísinn horfinn þegar við mættum í hellinn. Hljóðin voru því ekki eins breytileg og vonast var til, en þó var ákaflega notalegt að gefa sér tíma til að setjast niður og hlusta. Last spring was cold and windy and 26th of May was no exception when I cycle downtown Reykjavik with my recording gear. It was a accordion day and members of the Accordion club of Reykjavik was playing in the city hall. When I arrive it was overcrowded and the sound quality was poor from the amplified monitors. So I decided to stay outside and listen instead to the birds on the pound, close to the hall. This recording contain my walk beside the pond, from the southeast side (as seen on the picture) trough the city hall to the northwest side, into very different atmosphere. Þann 26 maí gerði ég mér ferð í ráðhúsið í norðankalda til að hlusta á Harmonikkufélag Reykjavíkur spila á hinum árvissa harmonikkudegi. Það átti ekki að koma á óvart að hljómburðurinn í Ráðhúsinu var handónýtur svo ég staldraði stutt við. Í staðinn fór ég að fylgjast með fuglum á tjörninni og hljóðrita það sem fyrir augu og eyru bar.